NY Times' Pete Wells Rips Per Se and Calls Food as "Appealing as Bong Water"
Pete Wells, the New York Times restaurant critic who recently wrote a surprisingly glowing review of the new Time's Square Señor Frog’s outpost, had harsh words for Chef Thomas Keller's Per Se, easily one of New York's most acclaimed and most expensive fine dining restaurants. In his new review of the restaurant published Tuesday, Wells shared such descriptions as "respectably dull at best," "random and purposeless," and "rubbery and flavorless." Mind you, he's talking about things he ate during meals that will run you hundreds of dollars. "I don’t know what could have saved limp, dispiriting yam dumplings, but it definitely wasn’t a lukewarm matsutake mushroom bouillon as murky and appealing as bong water." In 2011, the Times blessed Per Se with a four-star rating, but Wells said it was time to give that assessment "a hard look," and to see if Per Se could earn such high marks today. After visiting the restaurant a few times in recent months, though, he said, "In its current form and at its current price, Per Se struggled and failed to do this, ranging from respectably dull at best to disappointingly flat-footed at worst." This comes after Per Se was named the No. 2 best restaurant in the world by a new global ranking out of France and took the No. 40 spot on the regarded World's 50 Best Restaurants of 2015. "The kitchen could improve the bacon-wrapped cylinder of quail simply by not placing it on top of a dismal green pulp of cooked romaine lettuce, crunchy and mushy at once. Draining off the gluey, oily liquid would have helped a mushroom potpie from turning into a swampy mess. I don’t know what could have saved limp, dispiriting yam dumplings, but it definitely wasn’t a lukewarm matsutake mushroom bouillon as murky and appealing as bong water." "Along this gravel road, there were some smooth stretches. Lubina, the European sea bass, was sheathed in handsome golden scales of potato and bewitchingly sauced with a reduction of red wine and port swirled with butter. Bulging agnolotti filled with butternut squash and mascarpone were fat envelopes of pure pleasure. The flavors and colors of roasted sunchokes, vinegared beets, peeled Concord grapes and puréed pistachios came together in vivid harmony." 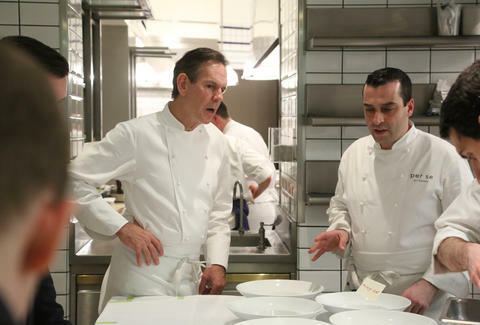 But dozens of dishes and thousands of dollars later, Wells believes Per Se is "among the worst food deals in New York" and concludes his review by saying that the aforementioned food, and service he describes as "oblivious sleepwalking," are just not worth the time and the money. He knocked Per Se down to just two stars. But his descriptions said far more than the poor rating ever could. Tony Merevick is Cities News Editor at Thrillist and would probably rant too if his lobster was served with a coating of "cold oatmeal." Send news tips to news@thrillist.com and follow him on Twitter @tonymerevick.